Trout fishing has always been a popular form of fishing. Even the most seasoned fisherman enjoys learning new trout fishing tips or reinforcing when he already knew but may have forgotten. You could have the best trout lures on the market, but if you do not know when and where to fish in order to be the most productive, the kind of tackle you use won’t make much of a difference. Learn the best places to fish in both streams and lakes below, as well the difference in flies and what kind of equipment you should have at hand. Understanding your prey. What are trouts? Trout are fish with heightened senses and a keen awareness of their surroundings. Because of this, it is important to understand the characteristics of their species so you can be successful in luring them to your bait. The following trout fishing guide will give you the opportunity to learn about these fish, their senses, and how to best match up your fish bait so they will be attracted to it. Trout are members of the salmon family, and they can be categorized into two types: true trout and chars. You can tell which category a trout lies by its outward characteristics. True trout have light colored skin with darker colored spots. These would include browns and rainbows. The coloring of chars is inverted; they have darker skin with lighter spots. Arctic char and brook trout are part of the char family. You may be familiar with the idea that trout are mostly located in streams. This is because they need the current of streams in order to spawn. Sometimes trout are located in lakes; if they are, they were stocked, or else there is access to a feeder stream in the lake so they can still spawn even though their habitat is primarily in a lake. Another reason why trout mostly live in streams is because they thrive in cold water that is between 50 and 70 degrees in temperature. Because of this, streams fed by springs or melting snow make perfect habitats for these fish because their water temperatures will always be chilly. Trout can live in other types of water, but they must be located in regions far enough North to live year-round. It is important for anglers to be aware of a trout’s senses, primarily their sense of vision. Not only can these fish see in color, but their field of vision is very wide. This is because of the way light rays bend the water. This allows trout to see behind them. Since they are able to see colors, you need to select trout lures that match what your targets are currently eating. Otherwise, your bait will be ignored. It does not take much to spook a trout. Their senses are so heightened that they can detect a human’s footsteps along the banks of a stream. They can perceive these vibrations to be an oncoming predator and become spooked. Because of this, as well as their wide range of vision, it is imperative that you remain very quiet and do not make sudden movements while trout fishing. As previously mentioned, it is very important to know what trout are eating so you can select trout bait that resembles their current food. The phrase “match the hatch” means knowing the stage of the insects in your area, whether they are in the nymph stage or adults, for example, so that your bait mimics that. One way to determine this is by examining hatch charts. Many states’ DNR websites will update this information regularly so you can see what insects are hatching in your geographic location. Other ways you can find out what trout in your area are eating are to use a stomach pump or a seine. A stomach pump uses a suction tube to extract recently digested food from a trout’s digestive organs. A seine is a large net used to trap organisms from a stream’s bottom. By unearthing items like rocks from the bottom of a stream, you can stir up the water and allow insects to become caught in the seine. If you do not have these instruments in your trout gear collection, you can always examine weeds in the stream or overturn rocks along the banks to find out what the insects in your area are looking like. While there are plenty of trout to be caught using a spinning reel, fly fishing for trout tends to be the more beloved method of trout fishing. Not only is it an extremely old and tried-and-true fishing method, it can also be more effective than bait casting because those lures can scare away fish due to their unwieldy shape and size. Flies, on the other hand, are trout lures that do an excellent job of imitating insects and are typically quite nimble. There are many different types of techniques to employ when fly fishing for trout; the type of fishing bait you use as well as your casting methods will vary depending on your fishing location. In fly fishing imitation flies are used to mimic the food found naturally in a trout’s habitat. Feathers, fur, and string are some of the components that these rainbow trout lures are made from. Fly fishing rods are much longer than a normal trout fishing rod but also made of lighter materials. Fly fishing line is heavier than regular fishing line because of the plastic coating which aids in casting and causes the line to float. Fly fishing is easy to learn and enjoyed be people of all ages making it one the best best trout lures available. Obviously, casting is an extremely important part of fly fishing. It can take anglers a long time to perfect the art of casting with a fly rod. If you are a beginning fly fisherman, there is a basic cast with which to start; later, different casting methods may be learned. The overhead cast works well in trout streams. It is designed for short to medium casts. To start out, let out as much line from your rod as you think you will need and allow it to float or gather in front of you. Point your rod in the direction you will be casting in preparation for your back-cast. Your back-cast should be a sharp, fast motion that will cause your line to draw back. After your back-cast, your line should make the shape of a J in the air. Once this has been achieved, move your rod forward, moving slowly at first and then increasing your speed. An abrupt stop of your rod’s movement will cause your line to shoot forward into the water, and your cast is now complete. As previously mentioned, casting with a fly rod will take a lot of practice. It is generally best to practice in a wide open area; if you are just beginning to learn to fly fish and try casting in wooded or weedy areas, you might become frustrated quickly due to the possibility of getting your line tangled with the nature surrounding you. Trout eat insects, so being out in the stream or on the lake when the insects are also out will help your lure a hungry fish looking for a meal. Insects normally come out at night, so many anglers will fish when the sun is low in the sky, either late in the afternoon or at night. Remember, though, that feeding times do depend on the water temperatures, which are regulated by the season. In the spring, the water is less cold in the later afternoon, so trout are active during this time of day. However, in the summertime, the oppressive heat and warmer water temperatures force trout to feed in the early morning. By simply altering your fishing times during these seasons, you can monopolize on the natural feeding habits of your targets. In streams, trout will feed in places that have been established as areas where food gathers naturally, like eddies. You can also try attracting a trout even when it is not a prime feeding time by luring them out of the places where they hide when they are not feeding. These are typically dark, shady areas like pools and underneath big rocks. If you are fishing a lake, trout stay close to the shore so they can feed on the insects that are readily available there. Weed-beds are another prime location since they are shallow and provide protection. In the summer, you may find trout congregating in deeper waters because the water will be cooler there. A trout tip to try when you would like to change up your regular fishing routine is to try using jigs on an ultralight setup. Since you will be trying to match the appearance of nymphs in the water, colors like brown, black, and white work well. One thing to remember when trout fishing with this type of fish bait is to set your hook even if you are in doubt about actually having a bite. Trout will not strike aggressively on a jig, so you might not feel a strike very much if at all. Fish with jigs like how you would with other rigs; cast upstream and all the current to carry your jig back down. Once you have mastered casting with a fly rod as well as have a good understanding of the types of flies and when it is best to use them, you will be well on your way to landing all sorts of trout on your next trip to the stream. Fly fishing is probably the most frequently thought of method used when trout fishing. Although the most popular way to fly fish is by using a fly rod, it is also possible to use a spinning rod with a small bobber attached 18 to 24 inches up from the fly to aid in casting. There are trout flies that match just about any type of insect you will find along a trout stream or river. Using the correct trout flies for the season is critical. The thing to remember here is to match the hatch. Don’t expect to catch many rainbow trout using dry flies after a heavy spring rain. Not all flies are alike. There are several types of flies that imitate many different insects and baitfish, including dry and wet flies, streamers, nymphs, and special purpose flies. There are varied techniques for using each of these fly types, which this trout fishing guide will outline. A dry fly is a fly that is fished on the surface of the water. This type of fly is intended to mimic an insect landing on the top of the water. The insects dry flies mimic include mayflies, dragonflies, grasshoppers, caddisflies and stoneflies. Dry flies are good for beginning fly fishermen to use because strikes are easy to see. Dry trout flies are a popular choice for fly fishermen because they are typically the easiest way to deceive a trout. Since the fly floats along the surface of the water, anglers know exactly where their fly is at all times and can anticipate strikes since trout approaching the surface of the water are generally visible. Using a paste on your dry flies will ensure they will float near the water’s surface. One of the biggest mistakes that can be made when fly fishing with dry flies is to pick a fly that is too large for the kind of insect you are aiming to match. It is better to use a fly that is on the small side than to go too big. When fishing with dry flies, you will want to cast upstream so that the stream’s current can carry it. If you cast diagonally as opposed to straight upstream, you can help prevent your line from spooking the fish. One of the most important guidelines when trout fishing with dry flies is to avoid drag. You want your fish bait to look as natural as possible on the water so that a strike is likely. If you allow your fly to float faster or slower than the stream’s current or create wake, your fly will appear abnormal to the fish, decreasing your chances of getting a bite. However, you can employ a technique that will imitate an insect about to fly if trout are ignoring your drifting fly. By flicking your rod for 2-3 seconds at a time so that the fly moves erratically in the water, you may create enough movement to attract an otherwise disinterested trout. If you want to fish in a nook that is hard to reach, you may have success casting downstream toward that location. Generally, you will want to cast upstream and allow your fly to drift into a natural position in line with the stream’s current. Make sure that you are casting diagonally; otherwise, your line might float over a fish and scare it away. If you are trying to reach a difficult location, you can try to cast across the stream or downstream; however, you will probably have the most luck casting upstream. Dry flies are used to mimic adult insects, so before you fish a trout stream, make sure you have an understanding of what fish normally feed on before deciding to use dry flies. Once you have determined that dry flies will be a natural choice for a particular trout stream, you can apply paste dressing to your flies to allow them to float high on the water. Another method when fishing with dry flies that you may want to try is to use a short rod. Usually, you will not have to make long casts on a stream when you are using dry flies, so a longer road is not crucial. A wet fly is a fly that is fished below the surface of the water. These flies are tied in various patterns to represent drowned insects, baitfish and other underwater prey. Wet flies are more difficult to fish because the trout fisherman must feel the trout bite the lower rather than watch rainbow trout strike at the surface. Whereas dry flies float on a stream’s topwaters, a wet fly, which is meant to imitate an adult insect that has drowned, will sink quickly into the water. Some anglers prefer using wet flies as opposed to dry flies or another type of fly becausenot only are they easier to cast, they also require less casting than dry flies. The best way to fly fish for trout with wet flies is to cast across the stream and allow your fly to be carried by the current. Because of this, wet flies work best in areas with fast water currents. Another technique that can work for wet flies is to use two flies at one time by attaching your second fly to a dropper. A dropper that is three to four inches in length is preferable. If you are fishing for steelhead in chillier temperatures, make sure your wet flies sink well into the water’s depths. A nymph in biological terms is an immature form of an insect that live in the water similar to a larva. Nymphs in terms of trout flies are types of wet flies because they float below the surface of the water. The insects mimicked by nymph flies, such as dragon flies, mayflies, and stone flies, are generally always present in a body of water, making nymphs a reliable and versatile trout lure. You may choose to use weighted nymphs if you are fishing a stream with fast currents, or unweighted nymphs, which work best in shallow streams or slow water. A wet fly drift works well with nymphs; allow your fly to flow at the current’s pace. Using a strike indicator will help you determine a strike if you utilize this technique. Making short casts will also help you indicate a strike because twitching will be easier to see. This type of trout fly is designed to replicate a minnow or a leach. Streamers are obviously another form of wet flies because they float below the surface of the water. If landing a lunker of a trout is your preference, streamers work well for these ambitions. These large, bulky lures imitate baitfish and will make a vibration in the water that will attract larger trout. It is important to note, however, that streamers are not suitable for all weather conditions. They will work best during the times of year in which the water is cold. One of the best ways to fly fish for trout using streamers is to cast across the stream and allow the fly to drift as if you were fishing with a wet fly, particularly if the current is slow, as it will imitate a minnow swimming across the current. A slight twitch of your rod will also imitate a swimming baitfish. A trout’s appetite is not always limited to small insects or baitfish. Special flies that mimic ants, grasshoppers, crickets, and other animals can produce great catches depending on the area and the conditions. For example, if you are fishing in a meadow on a windy day, a grasshopper fly would be a great choice because it is likely that real grasshoppers were blown into the water. If you use a grasshopper fly, make sure that it is not moving much in the water; an occasional flick of your rod will suffice. Leech flies can be used to catch larger trout. Generally, these flies are made out of large feathers, which will appear unnatural in the water if your retrieval speed is too fast, so make sure to reel in slowly. Since ant flies can be difficult to spot in the water, cast short so you potential strikes are easier to spot. There are several standard pieces of equipment that should comprise every angler’s collection of trout fishing tackle. Line, leaders, and fishing bait like trout flies are all important components needed for successful fly fishing. Flies are probably the most important type of trout tackle; the types of flies you have will depend on how you want to fish. Dry flies are one of the most popular fly types. They float on the water and are meant to resemble insects that have reached maturation and are just about to fly for the first time. The phrase “match the hatch” is used when referring to dry flies. You want to pick dry flies that imitate hatched nymphs in both color and appearance. Wet flies, nymphs and streamers are both meant to sink. As the name suggests, nymph flies will appear like nymphs in the water. Streamers are meant to look like minnows or other bait fish. Even if you are not very familiar with fly fishing, you have probably realized that fly line looks vastly different from regular mono-filament fishing line. Fly line is thick and braided so it adds enough weight for casting. Since it would be virtually impossible to tie a hook to this dense line, some fly line is tapered so the end is thinner. Tapered leaders can also be used to allow anglers to easily tie hooks to the ends of their line. Most leaders used for fly fishing are 7-9 feet in length. Hooks are another important piece of the trout fishing tackle equation. Most hooks used for trout fishing are very small. If you are inclined to use salmon eggs as bait, salmon egg hooks are specialized hooks used in this scenario. These hooks have a very short shank; the hook almost looks like a circle because the hook is very curved and the ends nearly meet. Finding the right trout tackle is only half the battle; you also need to equip yourself with the appropriate attire and other accessories for fishing out on your favorite stream. Selecting the right rod, reel, vest, waders, and other trout fishing gear for your situation will make your angling experience as positive and fulfilling as possible. Fly fishing rods are quite a bit different from those used when fishing with traditional spinning tackle. Fly rods range in length from six feet up all the way to fourteen feet. They can be made from a variety of materials from traditional fishing rod materials like graphite or fiberglass to bamboo. In terms of rod weight, it should match the weight of the line you intend to use. Fly rods are categorized in weight classes from 1-15; however, most rods used for stream trout fishing are a three to seven weight. If you think you will be fishing an area with exceptionally large fish, you may need to go even higher than that. Many fishermen like long rods because they can handle more fishing line. However, if you are fishing a hard-to-reach area or one that is overgrown with weeds and brush, you could easily get tangled with a long rod. Because of this, it is important to consider where you will be fishing the most when you purchase your fly rod. Reels should be large enough to hold anywhere from 150-200 yards of line. A proper vest is an essential piece of trout gear. A vest allows you to carry all of your essential tackle without having to lug a tackle box with you. If you are going to be wading in a stream all day, a tackle box is just not practical. Most fishing vests have many compartments in various sizes so you will have spots for all your accouterments. Selecting a vest with a loop on the back to hook your net will allow you to have this piece of gear available when you need it but out of your way when you do not. Make sure you do not select a fishing vest that is too snug fitting. You will want one that can easily fit over your heaviest winter coat in case you will be doing any fishing in chilly weather. It is possible to fish a stream from the banks; however, this is typically not an ideal situation. There is usually too much vegetation. Waders allow anglers to stand in a trout stream so they can easily cast and catch fish. 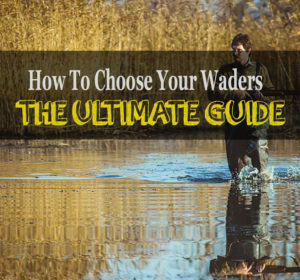 Most waders are either hip waders or chest waders. Hip waders are sufficient if the waters in which you will be wading are shallow. But if you can see yourself fishing in several feet of water, you will want to invest in chest waders, which look like overalls. Waders are made of many different kinds of materials. Rubber is a common material; they are durable and do not cost very much, but they will be very hot in the summer months. Neoprene is another option that is better for cold-weather fishing rather than summer angling. Nylon waders are lightweight and will keep you cool in the summer but they probably will not provide sufficient warmth when it is cold out. No matter the type of waders you decide to purchase, make sure you select something durable that will not be prone to leaks. While leaky waders might feel nice on your feet in the blazing summer heat, they will make your lower body quite cold if chilly stream water is leaking through in cooler weather. Other types of trout fishing gear to consider purchasing are stomach pumps andfly dressing. A stomach pump is useful in determining what trout are currently eating so you can use fishing bait that mimic these types of insects. Dressing is a helpful additive to your dry fly rig to help them float on the water. Selecting suitable gear and trout lures for your fishing environment and preferences will help you become a successful angler.